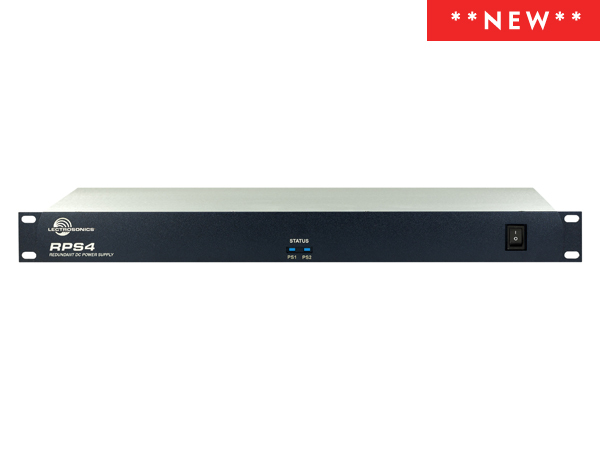 Introducing the NEW Lectrosonics RPS4, a 1RU, high-reliability DC power supply with four 12 V taps. The unit is designed as a 12V DC source for low-voltage devices such as wireless microphone receivers, IEM transmitters, IFB transmitters, and audio signal processing equipment. The 1RU chassis eliminates the need for a separate power strip with individual DC supplies for each device. Think Venue, Venue 2, Duet M2T and IFBT4. This unit makes a nice add-on sale for any studio, cart or installation. The RPS4 supplies four 12 V DC thread-locking (LZR type) taps, each providing up to 1.5 Amps. Two internal power supplies and two temperature-controlled fans operate in a failover mode for an automatic backup in the event one of them fails. Individual 2A automotive blade-type fuses protect each 12 V tap from overload or direct short. The unit can be powered by 100 to 240 V AC, 50/60 Hz. Output DC ripple is less than 20 mV. The unit ships with two 12 inch and two 18 inch DC supply cables. Contact Jose on +27 (0)87 551 1034 or info@stratosphere.co.za to place your order.